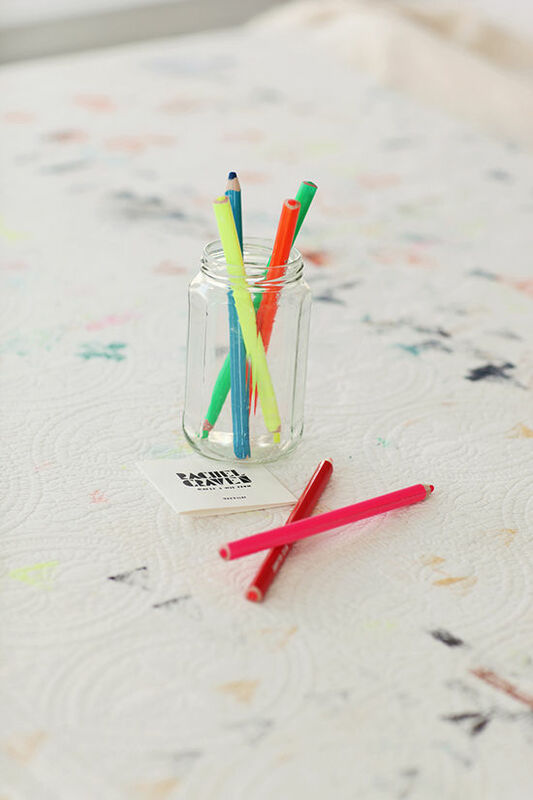 we are flowering the studio of the uber talented textile designer rachel craven today! rachel is a really close gal pal of mine and so I was super excited to pay a visit to her new downtown studio and check out her latest works. 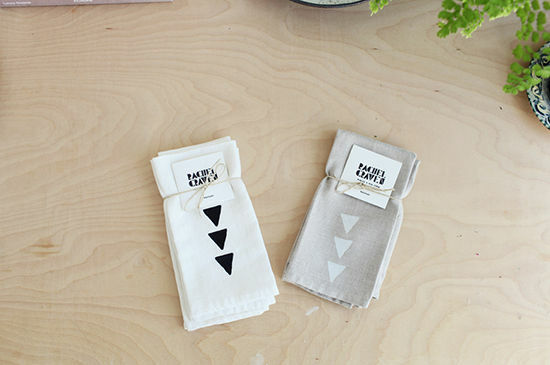 all rachel’s linens are made by hand here in LA. 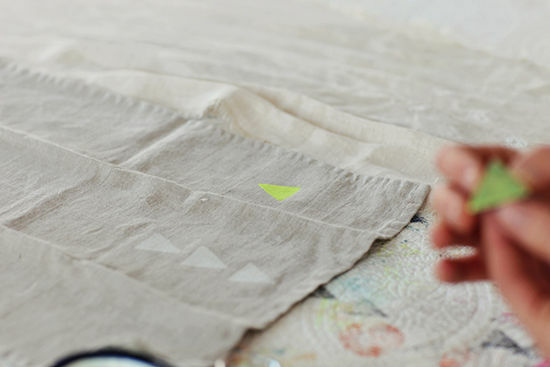 i love her clean lines and attention to detail…like the metallic copper stitching or neon pops on flax fabric. i was inspired to make rachel a little something different, so i put together a wreath + garland of spring florals that could hang in her new space. both rachel and i are big fans of monochromatic tones in pale shades of cream, white, and greens. 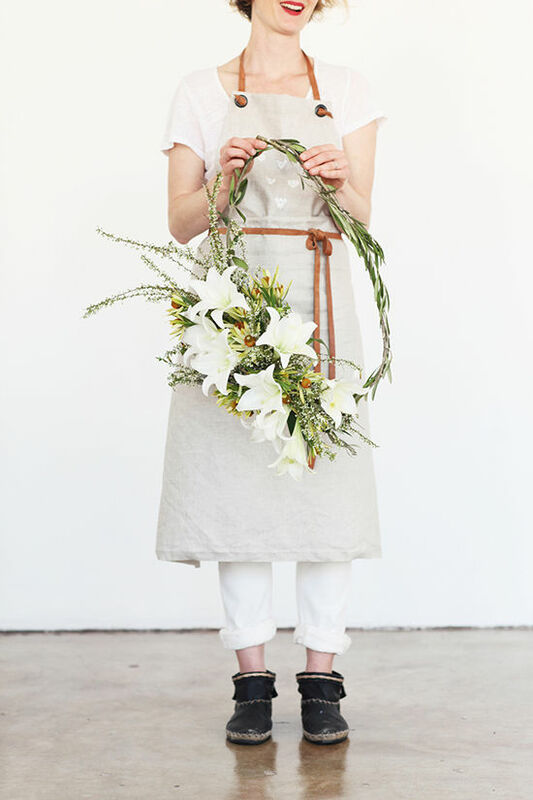 this earthy and organic wreath was something i knew would match rachel’s studio space and linens perfectly. 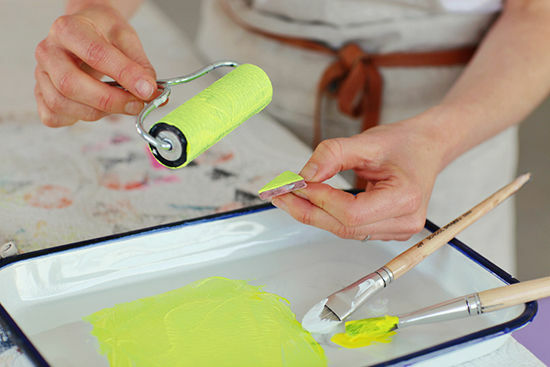 doesn’t this make you want to have a craft day at rachel’s studio? and you can get the apron she is wearing right here! How sweet! Yes, this definitely does make me want to go for a craft day at Rachel’s studio! This is my favorite series yall do! I LOVE all the florals you put together! Love the flower string hanging by the window. What a beautiful studio! This is so incredibly gorgeous! I’ve really been enjoying this column, as it has inspired be to add some actually life to my apartment! The string of flowers is such a perfect touch to a space. I can’t wait to try it. Just love everything Kristen does. Stunning. These all look so great. Something about pretty linens that gets me every time! Her studio looks so bright and you creations are so pretty as usual. This is such a beautiful, organic environment and you showcased it perfectly! I would loveeee to spend an afternoon creating there! what fun. what an inspirational work space! oh my gosh, her shoes! oh boy do i want those. I love the clean and open space. I also love the nice floral touches. I love the apron and I would love spending a day crafting with Rachel! 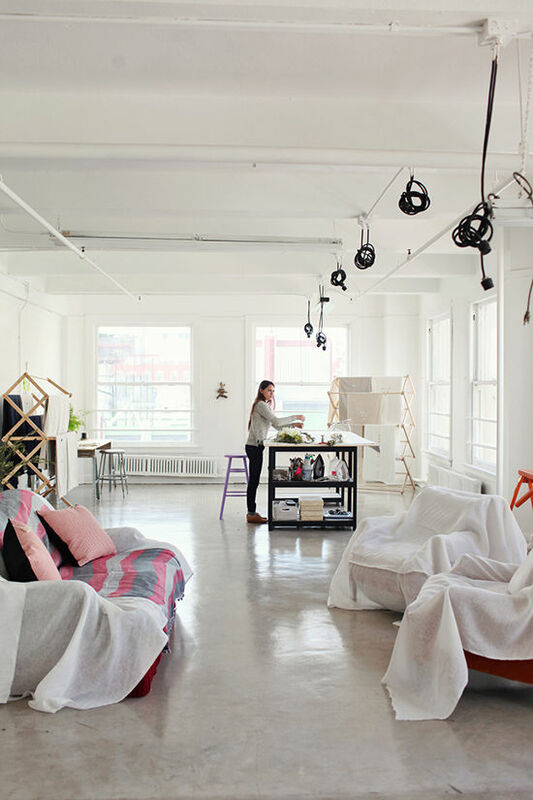 i am drooling over that studio! I want to go to there! 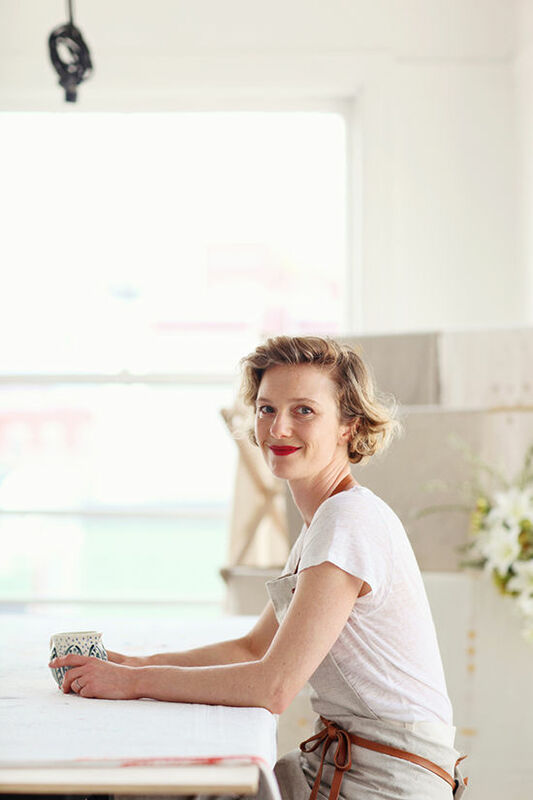 Such an inspiring space… I am obsessed with Rachel’s work and the flowers are such a perfect match with her aesthetic -IN LOVE! 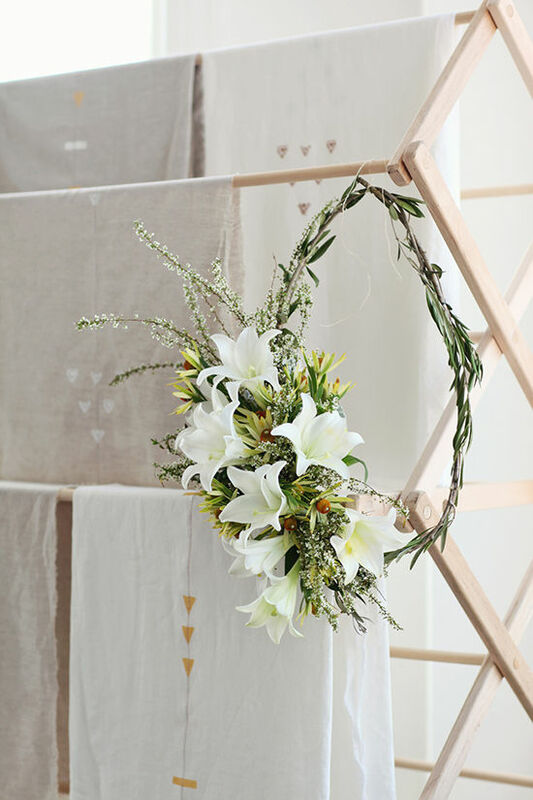 Love the simplicity of the hanging flowers…I’ve always hung my flowers to dry, but hidden them away during the process. What a mistake! I love everything about this post. That lovely woman with the pretty, natural face and big red lips. 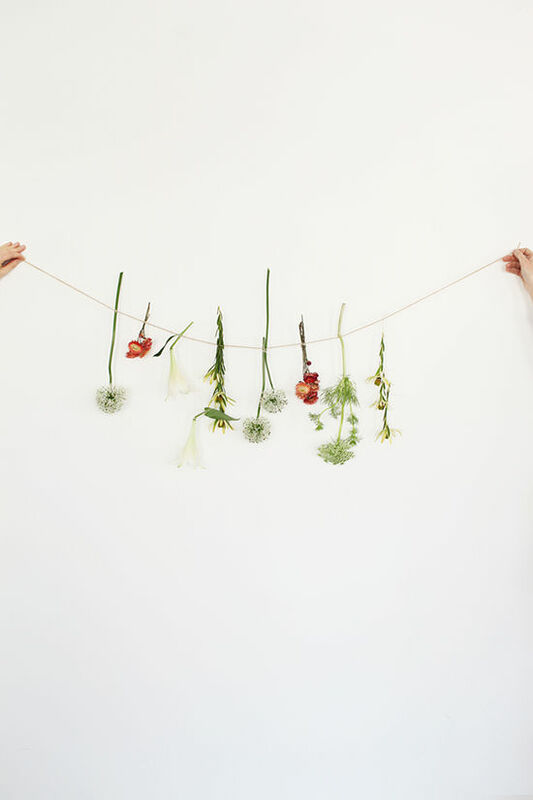 The flowers…I hang flowers upside down on my wall all the time but why have I never thought to string them together like that? I love that idea. That loft, seriously? Those windows and the light is making me crazy. 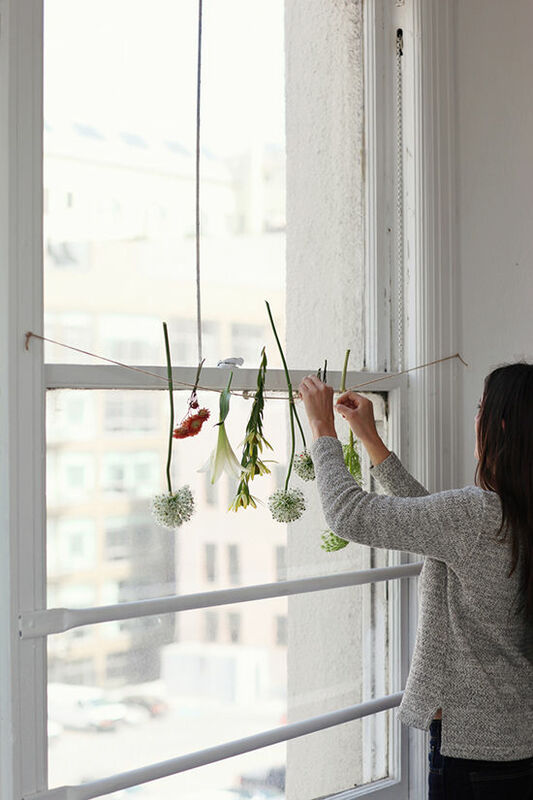 How did you do the flower string hanging in the window? It’s beautiful!